This penultimate post about NEET detectives makes me feel quite productive - only one more post to go! - but at the same time, it feels like the hardest to write. I'm a little sad to see this anime go. This batch was the final arc of the series, dealing with Ayaka and the return of her long-missing brother, Toshi. The story had to do with Angel Fix, an underground drug that had begun circulating Shibuya. While the story ended interestingly, this arc also dealt with the Ayaka-Narumi angle, something I'm conflicted about. 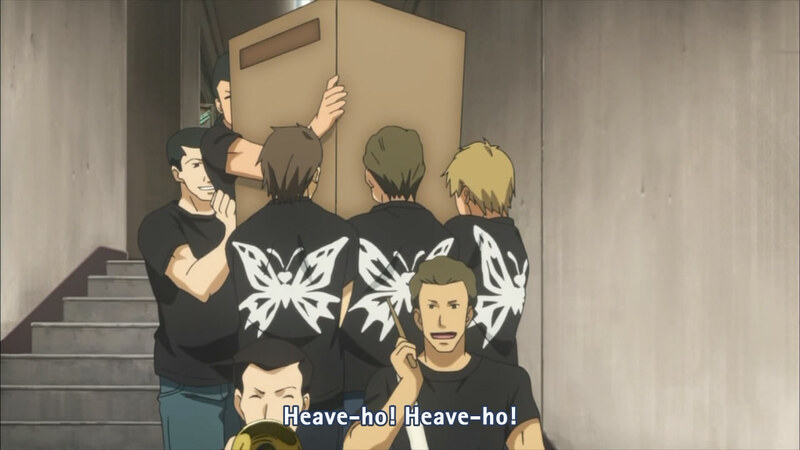 Just like ep09 foretold, Toshi had "returned" and the group ran into him at the arcade. It turned out that he wasn't so much "missing" as he had just left the house, preferring to be on his own. His behaviour and actions were quite strange, with some serious mood swings. 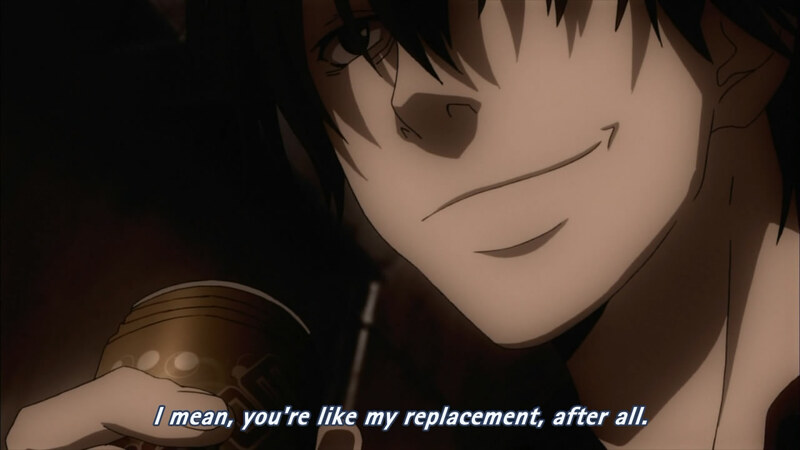 He went from being relatively timid (making me think he was depressed) to being cruel, telling Narumi that he was a replacement brother for Ayaka. When overcome by a fit of coughing, he pulled out a bag of little pink pills and took one. As Toshi had once been friends with the NEET detectives, the group desperately wanted to keep Ayaka from finding out more about her brother's "bad sides". So, when Tetsu informed Narumi that Toshi had dabbled in drugs before, he was put in quite the pinch to keep it a secret from Ayaka. It didn't seem bad at first, but it only got worse when Yondaime arrived with a request for Alice to determine the new drug dealers in Shibuya, passing out Angel Fix in the Hirasaka group's territory. This tension culminated in a fight between Narumi and Ayaka, when the former just came out and asked if he was a replacement. I didn't see it in the previous episodes and it didn't really show up too much with this one until the very end, but I wonder if Narumi has feelings for Ayaka (or vice versa). Ayaka has always seemed kind of outside the the picture, but that shouldn't dictate whether or not she likes Narumi. On his side, he's always seemed more concerned with his work - and Alice. How old is she? Is this criminal? 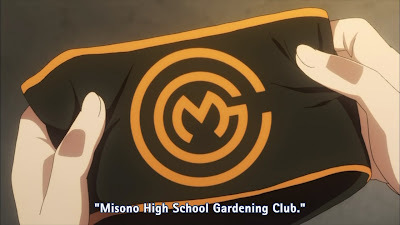 Anyway, their fight made Narumi feel uneasy and he spent a lot of time attempting to make it up to her by creating a new logo for the Gardening Club (using Photoshop, I noticed). It's always surprising that Alice can carry that bear. The two eventually made up (assisted by Narumi's gift, of course), and some time passed without much issue. However, as Narumi's voice-over "predicted", everything came back. While discussing their research outside the Hanamaru, Ayaka happened to overhear Shosha and Tetsu talking about Toshi taking drugs. This seemed to affect her, but she was okay in a later scene eating tiramisu with Narumi. 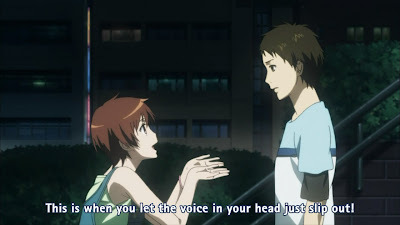 Their walk home was one of the most forced scenes I've seen in this anime (probably worse than the Meo Arc), where Narumi really did seem like he was very into her. When did that happen? The last time we see Ayaka, really. 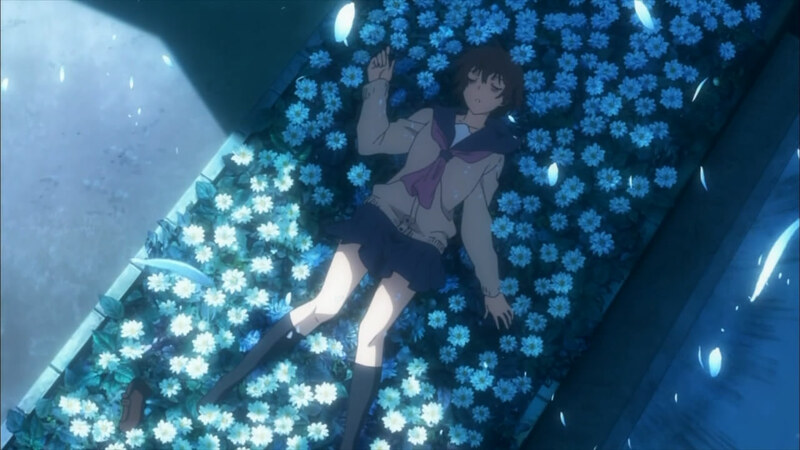 The episode ended in Ayaka falling from the roof of the school building, slipping into a coma due to her injuries. This is where ep11 picked up, with the discussion of what had actually happened. There was no suicide note, so it was being treated as an accident, and the doctors spoke about Ayaka not waking up unless a miracle happened. This stressed out Narumi quite a lot, to the point where he stopped attending school and stayed cooped up in his room. However, he eventually ventured to the Hanamaru, where a boxing "lesson" from Tetsu allowed him to release a lot of his pent-up frustration. With a fresh outlook, he went to Alice. Bonding? Will it mean nothing?! Here begins my confusion. What is Alice to Narumi? She's a peculiar girl, so the scenes the two have together have a lot more chemistry. But what I've learned about anime and Japan in general is that chemistry is not what's most important. He feels so at-ease with Alice, but he blushes with Ayaka. It's clear that the first one is a better option for a long-term relationship, but his motivation throughout this arc was always in helping Ayaka. What does that mean? 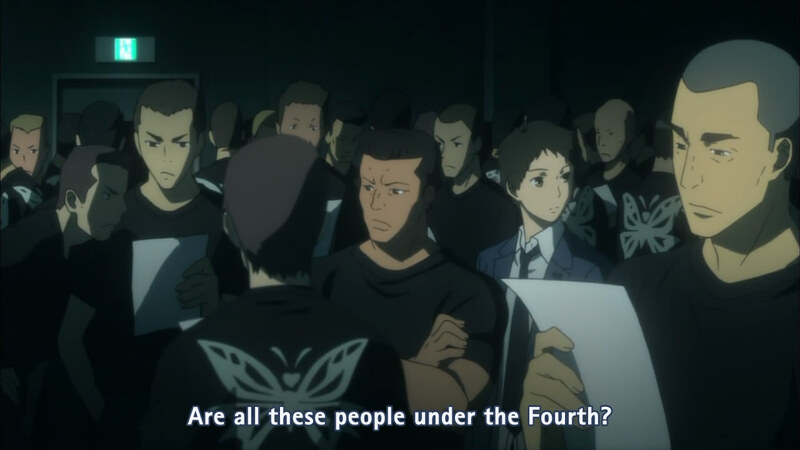 Most of them are "part-time" members. An encounter in the gardening shed at the high school with Yondaime led Narumi to understand that there was something more than he was being told. Yondaime, as he had said from the beginning, reiterated that Narumi needed to stay out of something so dangerous. However, Narumi's conversation with the teacher (to return the keys) revealed that there had been lots of flowers in the shed earlier, planted with seeds that Toshi had given Ayaka. With this newfound knowledge, Narumi ran to Alice (quite literally), who revealed that the Hakamizaka talked about in an earlier scene was indeed the mastermind behind the entire situation, using some kind of genetically-bred flower to create the narcotics used in Angel Fix. Wow, they need to be specifically asked. Did you mean "guide"? Interesting since Narumi saw white wings instead. The beginning of ep12 repeated the conversation from the end of ep11, which was essentially Toshi saying random things during a drugged-out trip and going through mood swings. 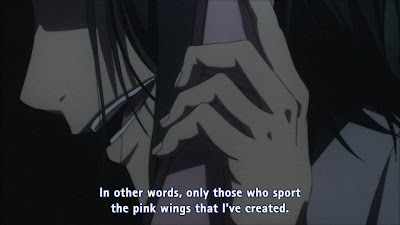 Hakamizaka pushed him around and snatched the phone away, saying some equally strange things to Narumi about how they should try to catch him before he sent everyone away to God with his pink wings. After getting to Alice, the trace of the cell phone's GPS led to a club owned by the Hirasaka Group (or, at least, under their protection), which pissed Yondaime off to no end. Hakamizaka had given the cell phone to a random boy and sent him off, which made me happy because otherwise it would have been a little too easy. His colouring is pretty good. Those are some difficult lines. An analysis of the potential effects of the drug, aided by Narumi realizing that the packet had a holographic symbol of wings on it, revealed that Angel Fix provided heightened senses (which had actually been seen as early as the beginning of ep10, as Toshi had played PPB with superhuman speed). 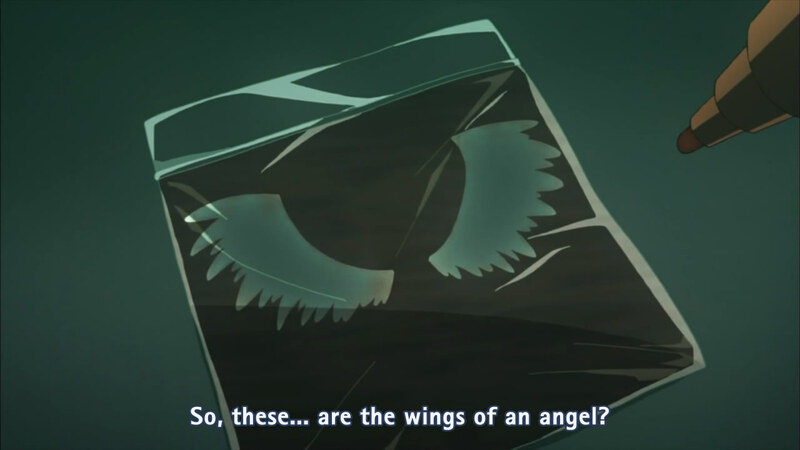 Due to the power of suggestions, the users probably had hallucinations involving the wings of an angel, thus they actually "saw" them. In that case, the reason that the dealers were so hard to find was that they weren't actually going out to find customers; the customers, already tripped out, were finding them. Based on a later scene where the same wings showed up on a woman's face (the woman being a dealer), I think perhaps it's some sort of "tattoo" or "mark" system, where someone taking the drug would see it and know the dealer. That's actually pretty interesting as a concept. 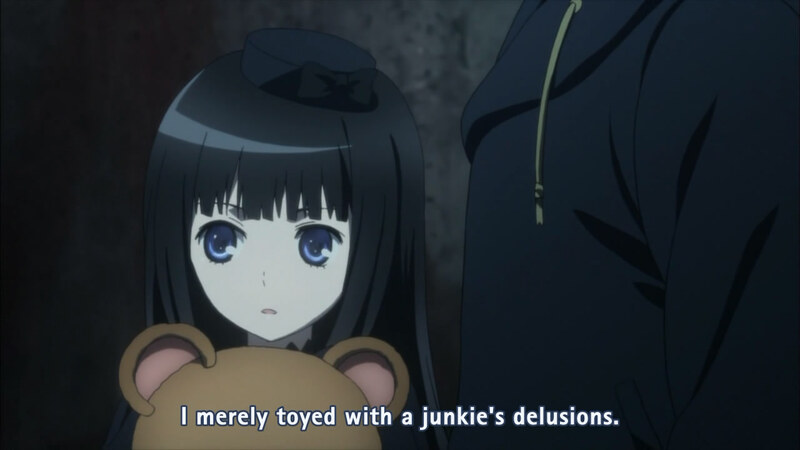 Since the only sure-fire way to find the dealers would be for one of them to try the drug, Narumi volunteered. Obviously, I was confused why he, weak of body, had to be the one, but then I understood: the drug surely has a lot of (unknown) side effects. Not everyone would jump into the fire, no matter how close friends they were with Narumi. Anyway, he took a pill and ended up on the streets of Shibuya, barely remembering what was going on. 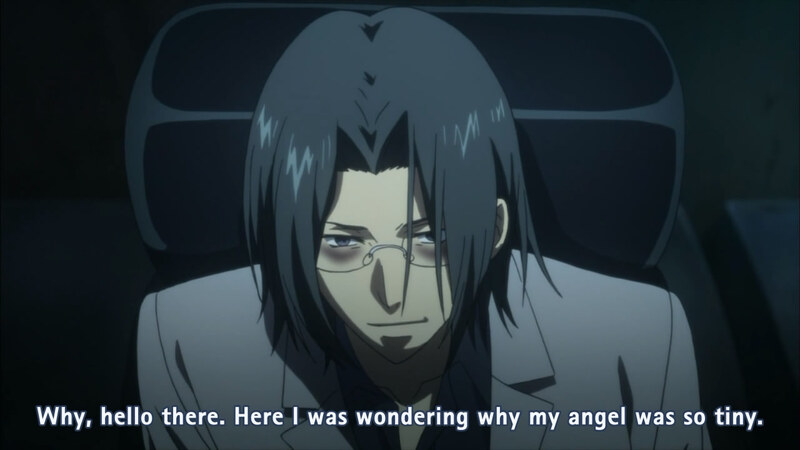 Despite him ripping off some of the monitoring devices, the group managed to keep up, and his hallucinations of his angel (Ayaka) led him right to a dealer with a flash of the wings on her face. 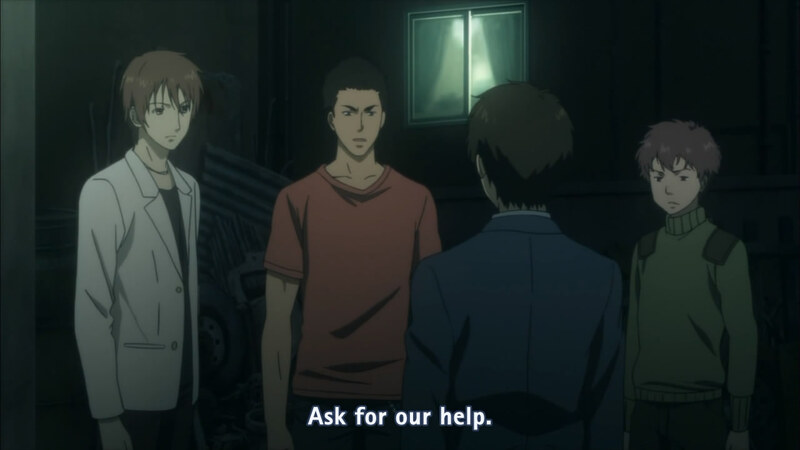 Tetsu restrained the deranged Narumi while Hiro followed the dealer. Why would be also be using the drug? The raid on the dealer's hideout revealed that everyone inside was drugged out on Angel Fix, as if they had known the end was near (or this is just how they end every night). I was surprised to see Hakamizaka also taking the drug; I didn't really understand why he did everything, if he were only going to die in the end as well. Perhaps he really did believe that angels were coming to take everyone away. Or perhaps he had gotten depressed and the drug amplified it so he decided to take everyone down with him, but eventually started believing his own words. Maybe he'd been taking the drug all along, in order to be able to do the intelligent things he did (like publishing papers on genetics), but it had eventually overcome his restraints and he went insane. Either way, Alice ruined his high by telling him there was no room for him in God's Kingdom (so religious...), and Yondaime left Toshi's handling up to Narumi...who proceeded to beat his face in for getting Ayaka involved. The overall anime will probably lose marks for this strange ending; it felt very anti-climactic and I didn't like it so much. There was still minutes after the arc ended, where Narumi attempted to get back to everyday life. After seasons passed, Alice took him to the school roof to show him what Ayaka had left behind - the club's logo scattered with the flowers that she had planted for Toshi (and that Hakamizaka used for the drug). 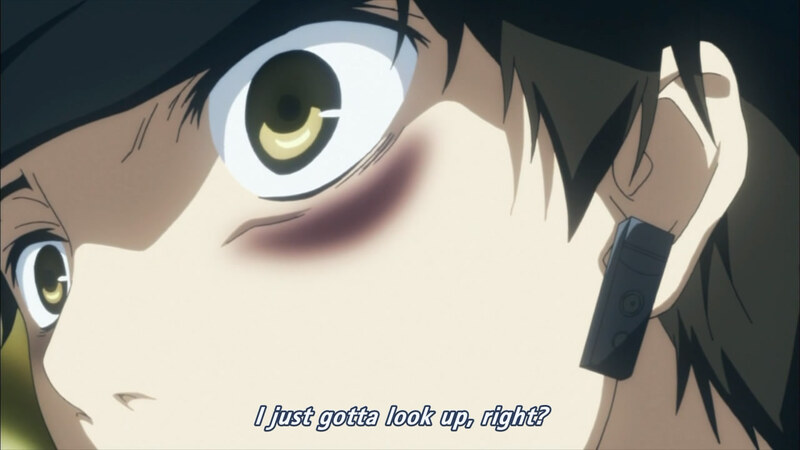 The two sat there, with Narumi crying and Alice shedding a single tear, and the anime closed on Ayaka's eyes opening. I don't understand what this means for the love triangle, if there was even one. It felt like they were gearing it up for a second season, but I'm not that excited. It felt too unfinished to begin with. Alice always has the last say. With this post, this anime comes to an end - finally. My love-hate relationship with it ends in confusion; I can't tell exactly where I am now. 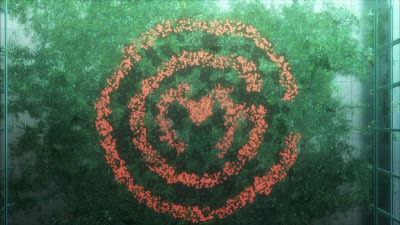 This arc was interesting and had good points - but, in terms of the actual ending shown at the end of ep12, I'm remembering the terribleness of the Meo Arc and sighing. Why can't it just be consistently good?